Tile Sizer | Tile Cutting Saw Tool | Wet Tile Cutter Aid | Buy Online Now! TileSizer™ is a specialty tile tool to aid in cutting tiles with a wet saw. One of the most versatile tile and flooring tools on the market for making intricate and precise cuts on small tile and mosaic tile. A multi-use tile tool that allows for horizontal, diagonal, notched, circular, and free form cuts. This patent pending design minimizes breakage and maximizes the ability to achieve the desired cut the first time. 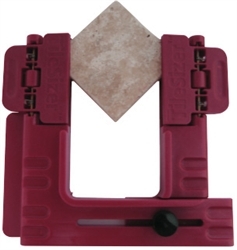 It is the perfect complementary tile cutting and installation tile tool. It is the ULTIMATE tile jig. This tile cutting tool can be used to secure all types of tile, including glass tile, mosaic tile, ceramic tile, porcelain tile, stone tile and travertine tile. Simply pair with a quality tile cutting saw and the TileSizer holds onto the tiles throughout the cuts, allowing for professional and precise results. Packaging includes (1) TileSIzer™ unit with instructions. Tile in photo is NOT included with purchase. For more information about TileSizer, check out our Solutions and Capable Cuts pages. You’ll find helpful instruction on how best to use TileSizer for different remodeling applications (kitchen, bathroom, fireplaces and more) on the Solutions page and you’ll learn how to best maneuver TileSizer to achieve a variety of cuts (corner, horizontal, diagonal and more) on the Capable Cuts page. Join many other satisfied users and buy TileSizer today! An overview of TileSizer™ and how it works with a tile cutting saw.